IF THE IAEA INSPECTED RESTAURANTS WE'D ALL GET FOOD POISONING! Jackie Mason: "...We are protected in this city from a bad tuna fish. We're not protected from a bomb." 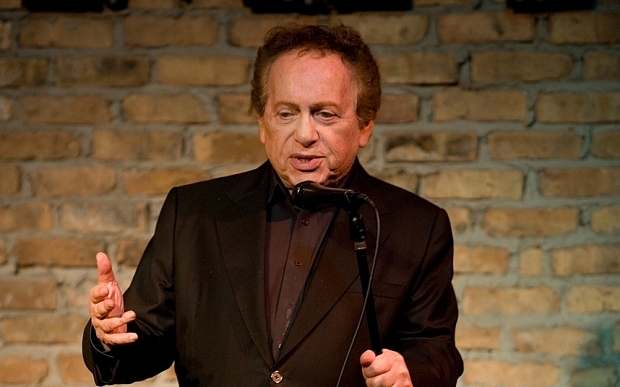 The iconic comedian, octogenarian, and ordained rabbi, Jackie Mason, was dead bang correct in his commentary, which has been highly posted over the last few days. I've got it! We need a comedian and celebrity chef to form foreign policy and save the world from Iran's nukes! During an interview Mason pointed out that in New York City the restaurant inspectors can show up any time, any day, unannounced, and without asking for permission, to check sanitation practices, unlike the inspection "deal" team Obama/Kerry spent over a year fretting, sweating, and begging Iran to sign off on. In that 'deal' - if yielding everything the other side wants without gaining much in return can be called a deal - the International Atomic Energy Agency (IAEA) is tasked with inspecting Iran's nuclear sites. We also released billions of dollars to a dangerous regime - Tehran and the IRGC is a group of folks who have caused more bloodshed than vampires at a Red Cross community drive. Well Obama stating the IAEA will serve as a strong watchdog to ensure the 'deal' is upheld, that's not comedy, it is theatre, but is also not entirely accurate, as I noted in an earlier article. For starters, the IAEA has to ask the fine friendly folks in Tehran for permission. I kid you not! The IAEA must give advance notice before visiting a site. And Iran can say "no" - as they have for years. They can also delay for 24 days. Can you imagine the NY Restaurant Inspection team being told to make an appointment by chefs or owners so that they have time to remove the rats from their prepping table, or city pet of NY (cockroach) from the salad bar? Imagine Gordon Ramsey being told he can't do a spot check on a restaurant he has agreed to turn around? He'd toss the owner out a window, and burn the kitchen down first! Maybe Obama should send Gordon Ramsey to Iran to inspect the kitchen chemists over there. I'd feel safer with him than the IAEA. Plus the guy knows how to cook! Second, Iran has, if you will excuse the pun, put a Chinese Wall (or battery of air defense systems) around certain sites Tehran deems military or high security (well duh, that's what nuclear weapons are). These sites are off limits to inspectors. Does anyone but the village idiot, POTUS, or our current Secretary of State (maybe we ought to hire Madam Secretary Tia Leone for future negotiations - at least her script writers are better than Kerry's) think Iran might hide a few things in those sites? Third - the IAEA as watchdog, or the nuclear equivalent of restaurant inspector? Where's Robert Irvine when we need him? To be sure my favorite thing to make for dinner is a reservation, but even with the NYC inspectors, and posted report cards on restaurant walls, most of us would NEVER eat out if we saw what the majority of kitchens looked like, even in our favorite haunts. That said, most restaurants are cooking up pasta and dim sum, or mixing martinis, not brewing uranium hexafluoride and plutonium cocktails. And yet we have sent an agency (IAEA) with a higher mission, and less authority, to protect the Middle East, if not the world from nuclear proliferation at the hands of people who consistently have broken the rules. Let's briefly look at the IAEA, which historically has been everything you wouldn't want in an agency tasked with preventing the world from nuclear disasters. The IAEA has had bad, often anti-West, anti-Israel leadership (El Baredei), is often inept, behaves at times like Iran's lap dog, is underfunded, bureaucratic, works for the UN (shouldn't that be an automatic disqualifier? ), and frequently just plain ineffective in terms of stemming the growth of bad guys attempting to develop nuclear weapons. Doubt me? Let's see, there's North Korea. Iraq. Syria. Iran. Quite a track record for the IAEA! Oh wait....two of the four don't have a nuclear program anymore. How'd that happen? Hmmm, was it the UN (stop laughing)? Nope! Was it the US or our allies? Again stop laughing. How about Israel? You got it! Thanks to the Israeli Air Force, Iraq and Syria have a large hole in the ground where once stood their nuclear weapons program! This is historic fact. To which the IAEA has admitted they have missed a few things along the way, including some of Iran's break out developments. * Which goes to my point - if the IAEA was in charge of inspecting restaurants, we'd all be suffering from food poisoning. Barney Fife was not a good deputy, and he isn't a good nuclear inspector. But I could name enterprises and entities that would be better alternatives, ranging from the US nuclear teams, to some of the shadow paramilitary organizations based in the US. In the spirit of fair play, one has to acknowledge the "deal" has accomplished two historic results worthy of mentioning....Israelis agreeing on something near universally, and Arabs agreeing with Israelis on anything. Yes folks, even MK Livni agreed with PM Netanyahu - in fact virtually all the major players in the Knesset agreed the Obama deal with Iran is a bad deal. As most Jews will tell you, if you want five opinions invite two Jews - so to engender such solidarity among the Israeli leadership is pretty amazing. And to have several Arab states openly align with Israel over the bad deal Obama negotiated, again this is significant. But the real problem is getting Main Street USA to care about a bad deal that could very well impact the world, but is considered a Middle East or foreign policy issue. Without a groundswell of public opinion against the dangerous policies of Obama - whether on the border, on illegal migration, bad foreign policies such nuclear deals that have no hope of limiting nuclear proliferation, emboldening terrorists, or bad economic policies - if Main Street doesn't engage, it will be business as usual in Washington. First we need to connect the dots between what happens with foreign policy, domestic policy, immigration policy, and how it directly influences Main Street. We know instinctively our nation has changed, and not for the better with the current influx of folks from cultures distinctly different, and often failed cultures at that. Taxes climb, crime rates rise, and overcrowding occur in all sectors of a community. Declining quality of life and increasing dollars to pay for folks largely on welfare or utilizing hospitals, schools, fire/rescue, and police services. Second we need to change the language - there is no "here" or "there" - as one of the chairs for a terrorism conference, our team made a concerted effort to change the paradigm of "foreign" and "domestic" to "transnational." Why? Because borders, oceans, mountains and distance do not separate us anymore! We are a global world - avian flu or SARS can arrive from the Pacific Rim, MERS or ebola can arrive from Africa in hours or days. So can a dirty bomb, or terrorists, or FEDEX shipments of gifts from friends in Europe or Thailand. Since most of our food ingredients are from other parts of the world (China, S. America) it is not as if Main Street isn't aware of globalization. Part of the truth rests in the reality that most Americans take our cue from our leaders. It's not just along party lines either. Plus most people are concerned about mortgage payments, their kids' college tuition, medical bills, auto loans, the PTA, work and the like. Convincing them that a deal between the US and a country thousands of miles away in a region known for bloodshed and hostility, that it has an impact today, tomorrow or next week on their lives, well it is a disconnect. But the bigger picture - and one that can, in fact does impact Main Street USA is in play - the threat matrix that Iran, and other Anti-West, radical Islamic enterprises are playing well against us. It is a complex game involving infiltration (legal immigration, illegal migration, radicalization, recruitment) within our borders, using the power of politics to gain influence. It is a complex game of neutralizing strong allies who see through the deception, like Israel. Thanks to well funded pro Palestinian enterprises on campus, and in the halls of power from Capitol Hill to 1600 P, tapping into media bias against Tel Aviv, and other powerful anti Israel forces (Soros funded enterprises), Israel has been marginalized. It is a complex game of co-opting our leaders, understanding them so well as to manipulate their behaviors against US self interest. A prime example is Iran manipulating Obama, knowing he needs a 'Nixon to China' moment. Our leaders have sold us out - our security, our sovereignty, our culture, our language, and our national interests - for money (soft landing on K Street), power (GOP and DNC are guilty of this), or a legacy, hollow though it will be (Obama, Kerry, Clinton). Therein rests the tragic-comedy that Obama has foisted upon us in the name of unmaking America in the pursuit of making an Obama legacy. At the end of the day, it never was about securing nuclear weapons from Iran - they are there, some assembly required. It was never about protecting Israel - Kerry and Obama have insulted and attempted to isolate our ally - the only true democracy in the Middle East. It was never about weakening Iran - they have a better capability to launch payloads into space than the US does, and is unveiling both upgrades and new designs to their missile arsenal that will allow delivery of a nuclear warhead farther distances than pre 'deal' capabilities. Iran already had a vaunted defense system, and thanks to Obama, the folks in Tehran are about to receive an upgrade from Russia. It was never about balancing the Middle East - Obama already reached out to Iran to help with the foreign policy disaster known as ISIS, which placed Iran in a favored light, and further unbalanced the Middle East. It was never about being successful with Iran through sanctions. Iran already foments terrorism and has all but captured the flag of Syria, Lebanon, Yemen, and if unfettered, Bahrain, Iraq and other places in the Middle East will fall under Tehran's control. Like virtually everything in foreign policy today it is about the legacy (Obama) and the dollar (who among Obama's supporters gets to do business in and with Iran). Perhaps if Obama had to live in a region where Iran got to show its true colors, say like Israel, and deal with the threat of the Islamic Republic, akin to dining at a restaurant in a town without food inspectors, our POTUS might get a clue after a dose of food poisoning. Instead, Obama has given us a restaurant (Iran) capable of cooking nuclear weapons, but without an effective food inspection team (IAEA). Iran is nuclear, some assembly required, and the IAEA is incapable of protecting the world. Enjoy your tuna sandwich. * Breakout capability measures the time required for a country to produce sufficient fissile material for one nuclear bomb.